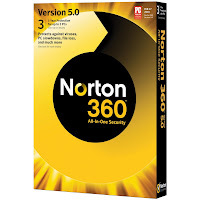 Another security suite from Norton - Norton 360 version 5.0 comes to you with complete set of safety features for your PC which includes protection from viruses, hacker threats, spyware, privacy threats and data/information loss. 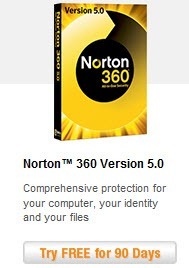 You can download 30 days trial version of Norton 360 5.0, but you system needs more period for security reasons. Norton is providing free 90 day trial version of Norton 360 5.0 for free or as giveaway. This free subscription is legal and contains no viruses or spyware/malware. Norton 360 5.0 security software is a combination of three powerful security components - Anti-virus, Anti-malware and Anti-spyware. These three components unite to offer strong resistance against internet threats. Norton 360 is different from Norton Antivirus and Norton Internet Security softwares, providing all-in-one protection with wide range of security features and targets complete family protection. On the other side, Norton 360 5.0 provides few advanced features and basic PC tune-up tasks. Check out the important features of Norton 360 5.0. Norton Insight - Checks your system files frequently for online threat detection. Automated Backup - Continuously backs up important files, documents, photos, videos, and other stuff. PC tuneup - Removes unnecessary files to better your system performance and runs start up applications more faster. Norton Safe Web - A browser add-on for detecting untrusted and unsafe websites in the search engine results and immediately blocks them. Social Media Scanner - Checks Facebook and Twitter feeds for suspicious links from Norton Control Center. Controlled Performance Alerts - Displays notifications if any program or application is running slow and make changes to improve the system performance. Parental or Family Protection - Online Activity measure to prevent your children from internet dangers. Online Rescue and Restore - Backup your important documents and files through a password-protected website and you can easily share, download, view or edit the files.